Had the opportunity to attend and be a part of a charity dinner for the organization ‘Akshayapatra’ – an ambitious initiative to feed millions of hungry children so that they can concentrate on getting a good education and become productive citizens. What is especially remarkable is the combination of extreme professionalism, technology deployment and operational efficiency, behind this massive operation. 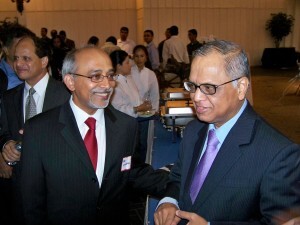 Not surprising, considering the names behind the movement – Desh Deshpande of MIT and Infosys Chairman Narayanamurthy. Not too many not-for-profit organizations can boast of so much success in such little time. We all have been in business meetings where we joke that we are not ‘solving world hunger’ when tackling problems. It was interesting to be at an event where the gathering seemed to be working on that very mission.